Used in the CM 6-45-3. 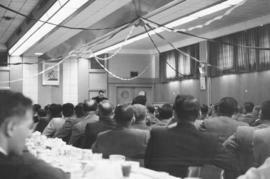 Inter-Mennonite Men's luncheon meeting in Kitchener, Ont. The speaker was Dr. L. Burkholder of GCBS, Indiana. Biblical theme park scene at Mile 108, B.C.